A lot of us who join a B-School either have a goal of doing an MBA to improve the knowledge and skill set or are told to do it to grow in life, courtesy parents and peer pressure. I feel that narrowing down to SDA Bocconi was one of the most spontaneous yet wisest decisions of my life. Cut to the first day of this prestigious institution, I entered the premises with a lot of anticipation and enthusiasm as I was going to meet an ocean of people dressed to impress in their suits. I was greeted by smiling faces of the management and was directed to the hall for our welcome. Inside the hall, I could feel the exuberance beaming from all directions as everyone in there was looking up with a smile as and when someone entered through the door. Our entire batch of 116 bright individuals was addressed by our honorable Dean, Mr. David Bardolet. He welcomed us to one of the biggest networks of the world, SDA Bocconi. 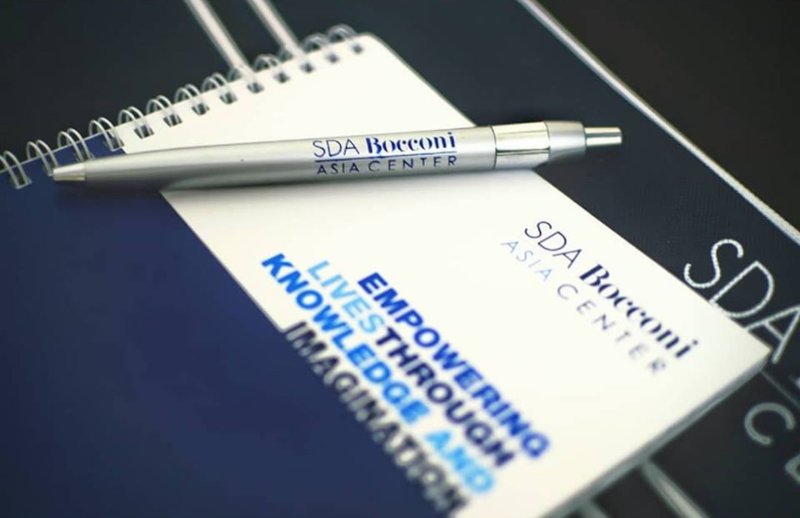 As Mr. Alessandro Giuliani our Managing Director greeted us, he disclosed that that our batch, IMB’7 Class of 2020 is the first batch at SDA Bocconi Asia Center to have an equal participation of men and women, who also represent 18 states of India! Now that’s diversity confines of our campus. While addressing the students, Prof. Grewal ignited a fire with her encouraging words and made us even more eager to dip our feet in the water. The special part about the entire ceremony was our Guest of Honour, Mr. Kevin Flynn, President and Managing Director, FCA India Automobiles Pvt. Ltd. (He’s the man responsible for the Jeep in India). With 44 years of experience, he shared his wisdom with us. “Be ruthless with time and gracious with people”. A good manager will always utilize their time to the fullest and at the same time, take care of their personal and professional relationships. Instead of being a loner, work in teams and move ahead along with people. This is one learning I will absorb and move ahead with from now on. The next session was a real ice-breaker. We were made to roam around in the hall in Brownian motion at different speeds and when asked to stop, we had to introduce ourselves to 3 new people with an adjective suffixing our name. This way, everyone interacted with at least 15 new people from our batch. Post that we had a team-building activity where we were divided into groups of 7 people. We had to pick a businessman/businesswoman whom we admired and had to build the tallest structure out of newspaper, duct tape, and scissors. This structure had to represent the qualities of the business person we picked. Even though my team’s structure wasn’t the tallest, we all learned one thing that evening; when in a team, respect everyone’s opinion and then act upon it. Don’t rush into things and always pay attention to detail. The evening ended with a Freshers party, “Benvenuti Amici” which was organized by our beloved seniors and the Cultural Club. The entire atmosphere was created to make us feel comfortable in this new space and interactive gaming sessions to help us get to know our seniors a little better. And which party doesn’t have dancing? That night we danced our way to a new chapter in our life, a journey to be cherished forever. Which ABGP company you will like to work with and why? Aditya Birla Fashion and Retail Limited is one of the pioneer companies in the Indian fashion and retail industry. It is always said that as you grow, help others grow. Well, after the consolidation of the branded apparel businesses of Aditya Birla Group in 2015, the company has only aimed to reach new heights in this segment. ABFRL has left no stone unturned to penetrate the domestic market and bringing international brands to India. Hackett London, Forever 21, Simon Carter and Ted Baker to name a few have experienced higher sales and higher visibility in the Indian market after the joint ventures. I, as an MBA student, am trying to garner the knowledge and the skill set apt to be a part of the ABFRL as it is the fastest growing organization. I believe that like-minded people always do wonders when coming together and I wish to be a part of such a team. The area which intrigues me and makes me want to join ABFRL is mergers and acquisitions to help bring more brands on board and expand the company’s foothold like never before.